While many brides stress out over finding the perfect wedding dress, many don’t pay mind to their bridal headpiece until the last minute. However, when you leave decisions like this to the last second, you will likely end up with a purchase that you will later regret. Maybe the headpiece doesn’t complement your dress, suit your style, or maybe you aren’t really feeling it. However, you purchased it because you know that you needed one, but panicked because you waited until the last second to pick up this vital wedding accessory. Once you find your perfect dress, you should start looking for your headpiece. The two should always go together if you want to avoid an impulse purchase that you may later regret. To help you find the perfect wedding accessory, check out these helpful bridal headpiece tips. If you plan on purchasing a headpiece with a veil, make sure you do this at the same time as your wedding dress. 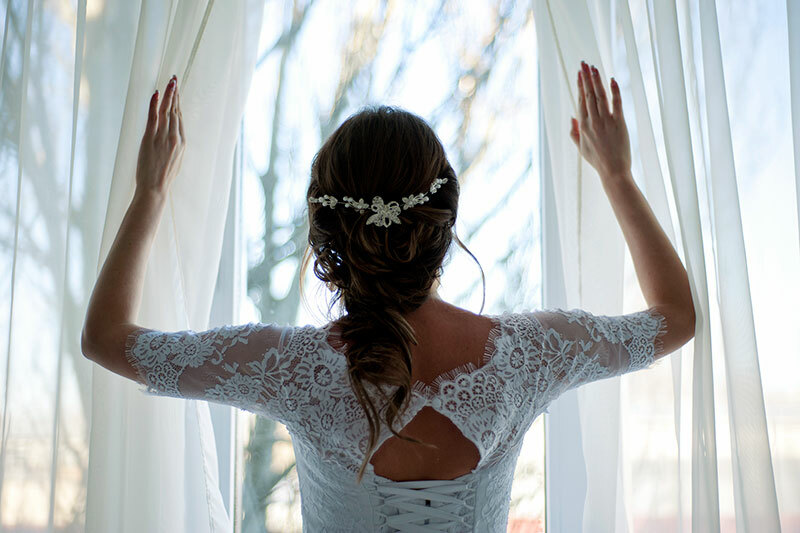 It doesn’t matter if you are going for a classic or modern veil, you will want to have your wedding dress handy, so you can ensure that the veil matches the dress. If you are not purchasing your headpiece at the same time as your wedding dress, make sure you bring along a photograph of your dress with you. Bringing along a photo of your wedding dress is helpful if you want to ensure that your headpiece complements your dress. Dare to be different, just don’t overdo it. Maybe you want your headpiece to be colorful, or large. Perhaps instead of a traditional headpiece, you want to wear a hat. Make sure to include your unique style, just make sure that you can successfully pull off the look. If you need flexibility make sure you go for a headpiece that can accommodate the natural shape of your head, no matter where you place it. Remember, some headpieces are designed for a specific area of your head. These headpieces can appear rigid and stiff, so they will not look right if they are positioned elsewhere. Don’t be afraid to try out all the different possibilities. You have a lot of options available to you. Try to keep an open mind since a bridal headpiece is not something you wear on a daily basis. You never know if you are going to like it if you don’t try it. Bring along a friend with you if you can’t make up your mind. Go for comfort. You will be wearing it all day. Plus, remember you will be doing a lot of hugging, walking, dancing, and posing for pictures so you will want a headpiece that will remain secure throughout the day. If you need some extra time to get used to your headpiece, practice wearing it before the wedding, just don’t let your fiancé see! Do you have an idea for your wedding hairstyle? If not, you should plan this aspect first before you purchase a headpiece. Depending on the hairstyle that you choose, this may limit your bridal headpiece options so make sure you think about this before your ideas become fixed. Otherwise, you could always bring your headpiece along with you when you have your hair trial! For more bridal tips, discover our tips for Staying Warm at Winter Weddings and How to Pick the Perfect Wedding Dress. If you’re in the process of planning your wedding and are looking for a unique wedding venue in New York City, discover the distinct advantages of the Aqua Azul. Say your vows on the deck of a luxury, private yacht and dance the night away in the middle of the New York harbor. Book a call with New York’s finest wedding venue.